Corrosion occurred in a client’s stainless steel products. Intertek metallurgy experts recommended actions to prevent corrosion from happening again. Following initial visual inspection, Intertek conducted optical microscopy on the suspect samples. Scanning electron microscopy was performed on metallographic sections. Optical microscopy showed structural details associated with sensitisation in the heat . . .
Environmental Challenges of Controlled Environment Light Fixtures “How to select clean room and containment area light fixtures that protect people, product and processes from particulates, pathogens, EMI, fires and explosions” The AIA presentation will focus on National Sanitation Foundation (NSF) P442, “Lighting Fixtures for Controlled Environments” and its relationship to . . .
Clear-Vu Lighting’s cleanLED is the first series of lighting fixtures designed, manufactured and tested to National Sanitation Foundation’s (NSF) Protocol P442, “Controlled Environment Lighting Fixtures”. NSF P442 is the first and only universally accepted publication that provides standards and testing procedures specifically for lighting fixtures utilized in pharmaceutical processing, bio-tech . . .
Clear-Vu Lighting launches a new, best-in-class line of edge-lit LED flat panels for recessed grid and surface mount ceiling applications. The uniformly illuminated panels eliminate glare, providing high levels of even illumination. The flat panels are easy to install, and requires virtually no maintenance. Architects and designers appreciate the flush-mount . . .
Clear-Vu Lighting launches its newest line of LED industrial lighting for cold storage facilities, ICE BAY LIGHT and ICE BAY LIGHT-IP, for the US domestic market at Global Cold Chain Alliance’s IARW-WFLO Convention & Expo in Hollywood, Florida, May 2013. 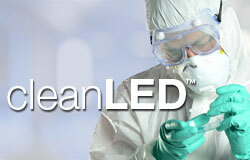 Clear-Vu Lighting’s 25 year experience engineering and manufacturing LED technology . . .
See a Youtube video of Clear-Vu’s FLEX SLS subjected to a 15′ drop test! Clear-Vu Lighting partners with NYSERDA and NY DDC to demonstrate the FLEX SLS (LED) Temporary Lighting system at the New Police Academy in Queens, NY. With the assistance of a NYSERDA grant, Clear-Vu Lighting is weeks away from providing its award-winning FLEX SLS Low Voltage Temporary Lighting System to the New Police Academy construction project in Queens, NY. Turner Construction Company is the construction manager of the project and Zwicker Electric is performing the installation . . .
New product development takes money, ingenuity and patience. When the product is built around a new technology—such as light-emitting diodes—money, ingenuity and patience are needed in spades. “We have learned people really need to play with it and test if for awhile before they believe you,” says Daniel Lax, the . . . LED Systems Provide Huge Energy Savings for Jobsite Lighting. On a Renzo Piano-designed renovation and expansion for Harvard Art Museums, the University and the general contractor, Skanska USA, paid attention to something that all too often gets ignored, even on green projects: inefficient jobsite lighting. By replacing the typical incandescent . . .